Some more basic tools that everyone should own are ratchets and sockets. They’re usually sold together in sets and aren’t useful without each other so I’ll talk about them together. 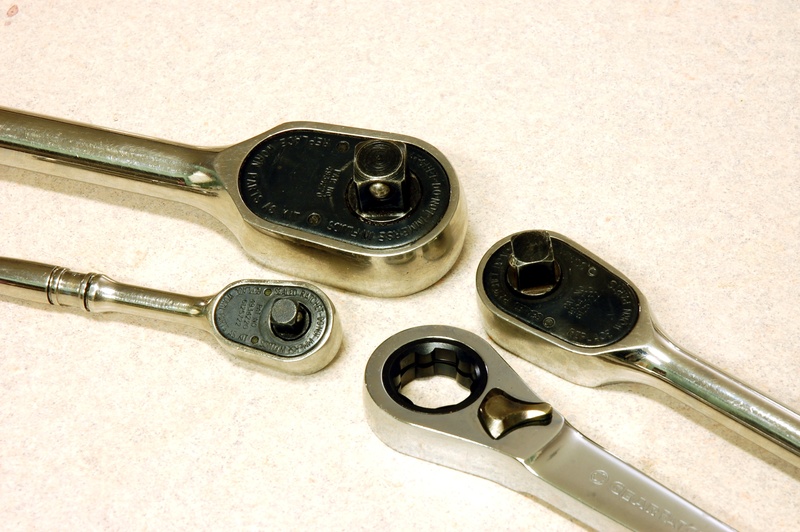 According to Wikipedia the ratchet (or socket wrench as it is also called) was patented back in 1863. So, like the wrench they’re another fundamental tool that has stood the test of time. The ratchet works by not letting the socket rotate when you turn the ratchet in one directions and letting it spin freely when you rotate the ratchet in the other direction. 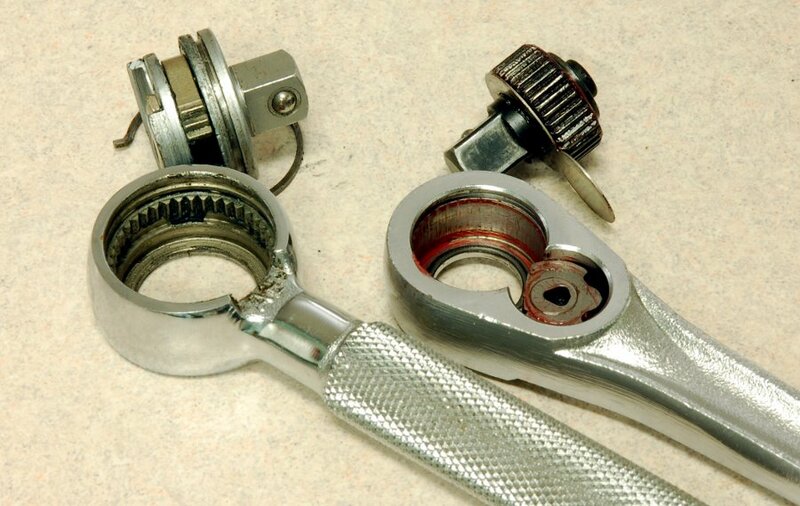 The direction that the ratchet works in can be switched via a lever or knob on the top of the ratchet. 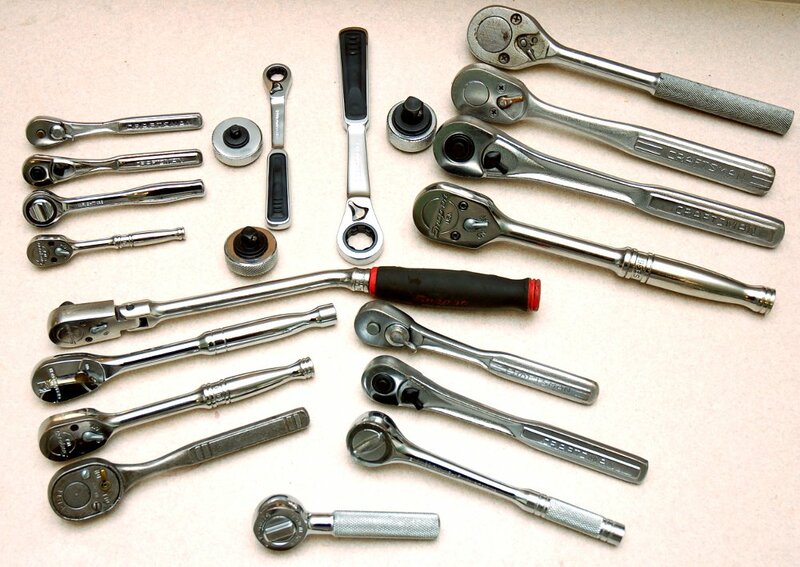 As you can see in the picture below, ratchets come in all shapes, sizes, drives, and styles. A distinguishing feature of the ratchet is the size of the square peg on it that the sockets seats on. This is called the “drive” size of the ratchet. The most common sizes are 1/4″, 3/8″ and 1/2″ though there are larger sizes. Typically, the larger the drive size the larger the ratchet is. A large, long handled ratchet on a small socket would make it very easy to over torque the fastener and would be cumbersome to use. 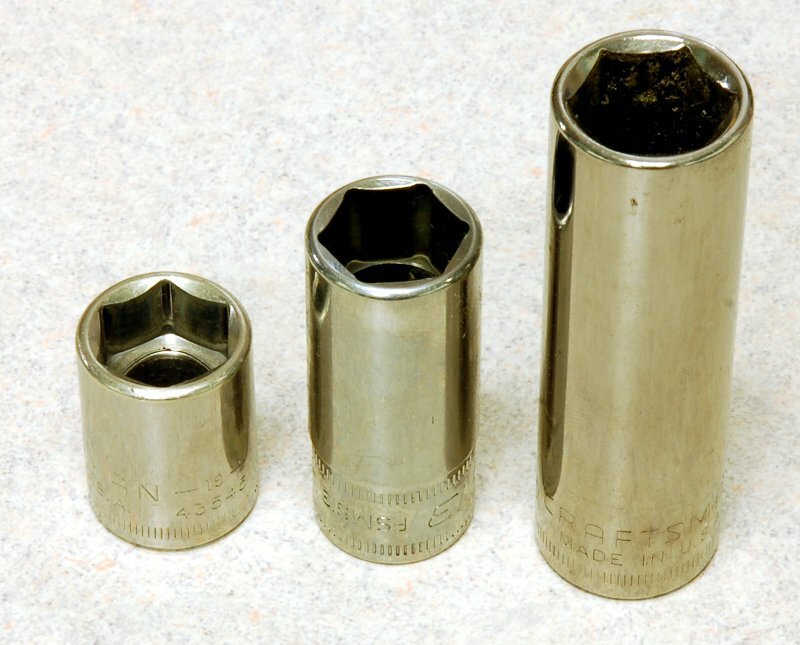 In the picture above, the ratchets in the top left corner are 1/4″ drive with 3/8″ drive in the lower center and 1/2″ drive in the upper right corner. In the very top center are a relatively new style of ratchet that hold onto the outside of the socket. The wheel looking ones, also ratchet and are useful for removing a fastener that is loose but not lose enough to remove with your fingers. If you look in the 3/8″ drive section you’ll see a long and short ratchet. The long ratchet features a bent handle and flexible head. These three features allow the ratchet to be used in areas where a normal ratchet can’t be used. The short, stubby, ratchet can be used in tight areas where a long handled ratchet cannot fit. 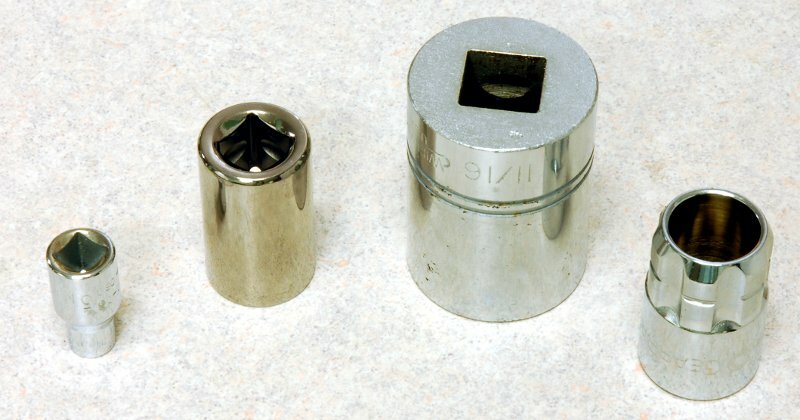 The picture below shows the square pegs in the different drive sizes mentioned before. A ratchet wouldn’t be useful without sockets. Sockets have a square hole on the bottom to fit onto the ratchet and various shapes on the other end to fit a fastener. The socket in the lower right hand corner is gripped by the ratchet from the outside via splines leaving the inside open to allow an object, such as a threaded rod, to pass through. The other side of the sockets can come in multiple shapes and sizes. In the picture below are a few examples. 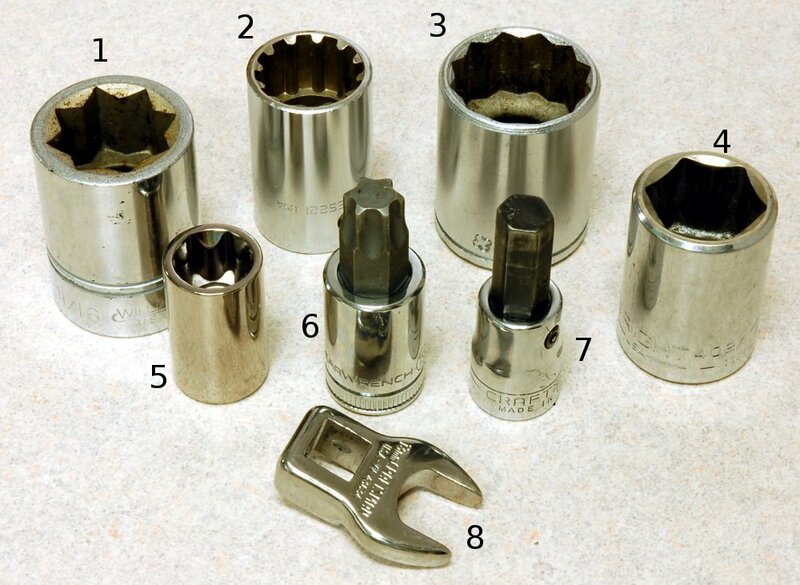 Starting from the top and going left to right we have: (1) 8 point, (2) spline, (3) 12 point, (4) 6 point, (5) external torx, (6) internal torx, (7) hex, and at the very bottom (8) crowsfoot. Yes, they make sockets that have a wrench on them or wrenches that fit on ratchets depending on your view. The 12 point socket is the most common these days with 6 point sockets coming in second. External torx, internal torx, and internal hex headed fasteners are found on todays vehicles and some electronics. Eight point sockets can be used on square bolts, which aren’t in use anymore but may still be encountered. The spine socket works on square, 12 point, 6 point, spline, and damaged fasteners. The crowsfoot works for getting to nuts or bolts that are put in horribly tight spots that you can see but can’t get any tool on. Regular sockets usually come in “shallow” and “deep” versions though some manufactures sell “mid-length” sockets as well. Short sockets fit well in tight spaces while longer sockets are able to get on to nuts that have the end of the bolt protruding from them preventing a short socket from engaging. They’re also useful for nuts on a threaded rod. In some cases the situation will determine the length of socket to be used while at other times it doesn’t matter. There are some useful accessories for the sockets and ratchet. The most important accessory is the extension (the bar looking ones). It serves to move the socket down from the bottom of the ratchet. This allows the socket to reach down to the fastener and the ratchet to stay higher up where it can be used. Other accessories allow sockets from one drive size to be used on a ratchet with a different drive size (top line, three on the right and second from left). Yet, another accessory are the swivel or universals that allow the socket to rotate to an angle that is not perpendicular to the ratchet bottom (to the right of the middle on the top two lines). An uncommon accessory is seen in the top right corner and is called a spinner. It fits in between the socket and ratchet allowing the ratchet to be turned by hand. It can also be used alone with a socket. Whats inside ratchets? Usually there is a combination of a pawl and gear. The pawl is the smaller part in the picture below with gear teeth. It is what rotates to change the direction of the ratchet. On the Craftsman on the right, the gear is a toothed wheel while in the SK on the left the gear teeth machined into the ratchet body. Some ratchets such as Snap-On (not shown in the picture below) only have one hole in the bottom and plate with an O-ring to keep dirt out of the mechanism. The number of teeth on the gear is also important. The number of teeth determines the angle between the handle in two engaged positions (called Gear Action by Snap-On). For example, a ratchet with 36 teeth will have to be rotated a minimum of 10 degrees before it can be used again while a ratchet with 72 teeth would only have to be rotated 5 degrees. This is an important feature for auto mechanics who have to use their tools in tight spaces. The top tool manufactures are up to 80 and 88 teeth and the upper tier Craftsman ratchets have 72 teeth. Oh, incase you’re wondering…In the first pic. 1/4″ ratchets from top to bottom are Craftsman, Craftsman, Wright, Snap-On. 3/8″ from top to bottom, alternating left to right are Snap-On, GearWrench, Craftsman, Snap-On, Craftsman, Proto, New Britain, SK. 1/2″ from to to bottom are Proto, Craftsman, Craftsman, Snap-On. The thumbwheels are Harbor Freight and the other two are GearWrench. If you’re looking to buy, pick up a 3/8″ drive set with metric and SAE sockets. They’ll fit most of the stuff you’ll encounter for normal around the house duties. If you’re doing automotive stuff then you already know having a variety of sockets, ratchets, and accessories can make things much easier. Which ones do I use the most? The four Snap-Ons. I used the newer Craftsman for a long time but then the 1/4″ started acting up and reversing on me. This aggravated me so I picked up a used Snap-On 1/4″ ratchet. That lead me to getting the other three. They’re awesome! The three older Craftsman ratchets were my grandfather’s and have sentimental value so I keep them around but don’t use them. The others I’ve picked up over time. I do like the 1/4″ Wight because it fits very comfortable to use. I imagine other drive size ratchet in the same style will make it to the tool box sometime soon for backups. Depending on what I’m doing on the car or if I’m having help, I do use more than one ratchet. In that case the specialty ratchets or newer Craftsman ratchets are used. And no, I don’t have enough ratchets…what a silly thought. Picking Nits. You refer the the wrench socket as both crow’s foot and wrench socket, but never say that they’re the same thing. Don’t worry, I’ll post eventually so you can return the favor. Ah good point. I’ve fixed it. It’s nice to have an editor! Very good knowledge of tools compiled by the editor. We can easily decide which tool to buy.